Disney, Apple, and Oracle could all easily double their dividends. Many income investors flock to the stocks with the highest yields. But in doing so, they often neglect stocks with average yields supported by low payout ratios and strong cash flows. These stocks can become good dividend growth plays over time, as management returns more of their robust cash flows to patient shareholders. Therefore, let's examine three stocks which have seemingly lower yields, but could easily double their dividends in the near future -- Disney (NYSE:DIS), Apple (NASDAQ:AAPL), and Oracle (NYSE:ORCL). Shares of Disney have fallen 7% this year due to concerns about cord cutters gutting its cable business. Its loss of ESPN subscribers indicated that not even live sports -- once considered immune from streaming competition -- could withstand the paradigm shift. However, Disney is evolving its cable business with new streaming apps and a stand-alone streaming service for ESPN, and its theme park and movie businesses remain strong. The House of Mouse has raised its dividend annually for the past six years. It also switched from an annual dividend to a semi-annual one last year. It currently pays a forward yield of 1.5%, which is easily supported by its payout ratio of 25%. Disney spent just 27% of its free cash flow on dividends -- indicating that it could easily double its dividend to become a more attractive income stock. Apple stock has risen just 2% this year, due to concerns about peaking iPhone, iPad, and Mac sales and its lack of new blockbuster products. Sales of all three iDevices fell year-over-year last quarter, resulting in Apple's first annual revenue decline since 2001. However, Apple's Services (iTunes, Apple Pay, Apple Music, Apple Care, licensing, and other services) revenue rose 24% annually and accounted for 13% of its top line -- indicating that software growth could help offset its hardware weakness over the next few quarters. Apple brought back its quarterly dividend in 2012 and raised it every subsequent year. It currently pays a forward yield of 2.1%, which is supported by a payout ratio of 26%. It spent 23% of its trailing 12-month FCF on dividends, which indicates that it could also double its dividend to reward patient investors. Shares of Oracle rose 7% this year, roughly matching the S&P 500's gain. Like many other aging tech companies, Oracle is pivoting its core IT hardware, database, and software business toward higher-growth cloud-based services. Its total cloud revenues surged 59% to $969 million, but that only accounted for 11% of its top line. Slower growth at its older on-premise businesses caused its revenue to grow just 2% annually for the quarter. Oracle started paying a dividend in 2009, but only raised its dividend annually for the past four years. It currently pays a forward yield of 1.5%, which is supported by its payout ratio of 29%. The company spent just 20% of its FCF on dividends over the past 12 months. Doubling its dividend could make Oracle an attractive income investment like its rival IBM, which pays a forward yield of 3.5%. The more free cash flow a company generates, the more likely it is to raise its dividend. By that measure, Disney and Apple seem more likely to hike their dividends than Oracle, which has struggled in that department over the past five years. However, Disney and Apple may also prefer to retain that cash for investments or acquisitions to diversify their businesses away from ESPN and the iPhone, respectively. Both companies were previously mentioned as potential suitors for Twitter, which has an enterprise value of $12 billion. Apple also expressed interest in buying Time Warner, which has an enterprise value of $89 billion, before AT&T agreed to buy it. Meanwhile, Oracle likely prefers using that cash to continue making big acquisitions, like its upcoming $9.3 billion takeover of NetSuite. 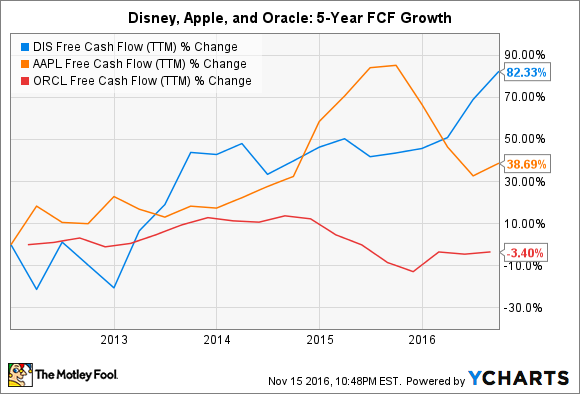 Disney, Apple, and Oracle could all easily double their dividends, but that doesn't necessarily mean that they'll do so anytime soon. Nonetheless, investors looking for stable income plays with room for dividend growth should keep a close eye on these stocks.